The NOVUS-IP Streaming Encoder is a real time compression solution that delivers unrivaled HD and SD video quality. The solution provides operators with the most powerful, cost effective architecture in the industry for enterprise and streaming video markets. The NOVUS-IP is ideally suited for IP video distribution over the internet, across a dedicated IP link or internally. 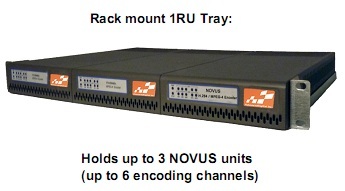 Up to 3 units can be installed in a 1RU rack mount tray, providing 6-channel H.264 HD / SD encoding. Single or Dual-Channel models: NOVUS-IP1, NOVUS-IP2. Video Inputs: support for Analog (Composite), SD-SDI, HD-SDI, and 3G-SDI, software selectable. Input video auto-detection. Audio Inputs: unbalanced (or balanced) analog stereo L/R, SDI embedded digital stereo (up to 4 pairs). Outputs: 2 Ethernet ports, supporting 100 Mb/s and 1 Gb/s operation. Support for UDP/IP on Ethernet. Closed-Captioning support (both EIA-608 and EIA-708 captions). Separate Ethernet ports for streaming and control.